By the time Dominic and Moira St. Clair get their ailing sister, Odessa, to Colorado Springs in the winter of 1883, she is nearly dead. Odessa has been seriously ailing for the past year from consumption, an illness that claimed the lives of four of her younger brothers, prompting her father to send his only surviving children west to chase the cure. This is a 400 page book that I read in 2 days. I've read some of Lisa Bergren's books before, but this one is great! Unfortunately it's the first in a series and then next one isn't due out for another year. Drat! 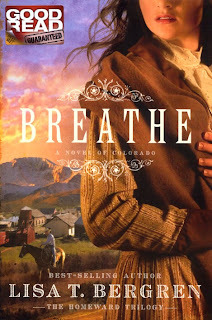 Breathe is almost more of a mystery than a romance, but it never gets too scary or too sappy! And once again I have learned something new about our country's history. I highly recommend this one!